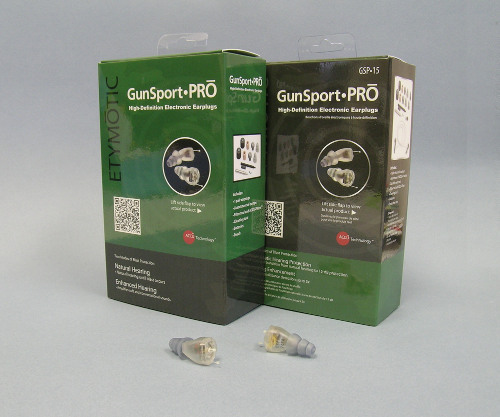 We are pleased to be partnered with Etymotic Research, Inc, the manufacturers of the well known Musicians' Earplugs, to provide specialists in Canada with high-fidelity headsets, monitors, and electronic noise protection. All of the products described on this page are distributed with multiple types of interchangeable "One-size-fits-all" eartips, or can be custom-fitted with Emsee adapters. With the goal of being the best headset under $200, Etymotic Research’s HF series uses high-quality balanced armature drivers that respond from 20Hz to 15kHz, with a low 16 ohm impedance and a 105dB@0.1v sensitivity. Suitable for many audiophiles as a personal listening device, it can also be used by amateur musicians who need stage monitors with an even response across the entire range of sound. 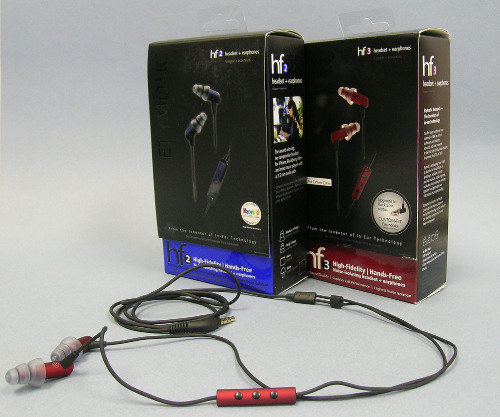 The HF5 headset’s output is approximately 85% accurate to live music when tested using the KEMAR manikin. Using the same drivers, the HF3 headset also includes a three-button inline remote with microphone for use with the iPhone and other Apple devices, or select the HF2 with a two-button mic/remote for controlling other smart devices. By using moving coil drivers, Etymotic was able to reduce the cost on the MC series while striving to keep the best sound quality possible. With accuracy approaching the HF series, the MC series maintains the same response range, but has a slightly lower sensitivity. MC5 earphones are suitable for budget-minded audiophiles, while the MC3 has a 3-button inline remote for use with Apple or other smart devices. Suitable for sound engineers, each side of an ER-4 headset’s balanced armature drivers are individually tuned, paired, and inspected, with a copy of the test results included with the headset. The ER-4PT is suitable for audiophiles who travel frequently; including additional filters, an airplane adapter, and a 3.5mm to ¼” jack adapter. Designed to reproduce live music as accurately as possible, the ER-4S assembly boasts a 92% accuracy score when tested at 25 points in the spectrum on a KEMAR manikin. This is suitable for sound engineers and also as stage monitors for semi-pro musicians. An adapter is available to convert the 4PT unit to a 4S by plugging it in between the headset and the source sound jack, for people that require flexibility on the go. Designed to provide protection from sudden sharp noises, both the GSP-1 and GSP-15 function as a “pass-through” at safe sound levels. Using Etymotic’s ACCU technology, they both monitor all sounds, and when unsafe blast-like noises are detected, immediately act to attenuate them. Select the GSP-1 for hunters, recreational or professional shooters, or police and military applications. In normal operation, this device will pass all sound through one-to-one until about 110dB. Above that point, the processor will cut all output, allowing the unit to function similar to a noise plug. A switch allows the user to also boost sounds under 60dB, tapering down to natural hearing from about 80dB, with the same blast protection as the normal program. The GSP-15 unit, suggested for heavy industry or mining, combines the blast cut-off features of the first model with a constant reduction of sounds for greater comfort. Sounds under 60dB are passed through naturally, and sounds above 85dB are reduced by 15dB, with a gradual step-down between those levels. When blasts above 110dB are detected, the unit will turn off for a moment in order to protect hearing, as described above. With the flip of a switch, the unit can be changed to the same “boost” program as the GSP-1.